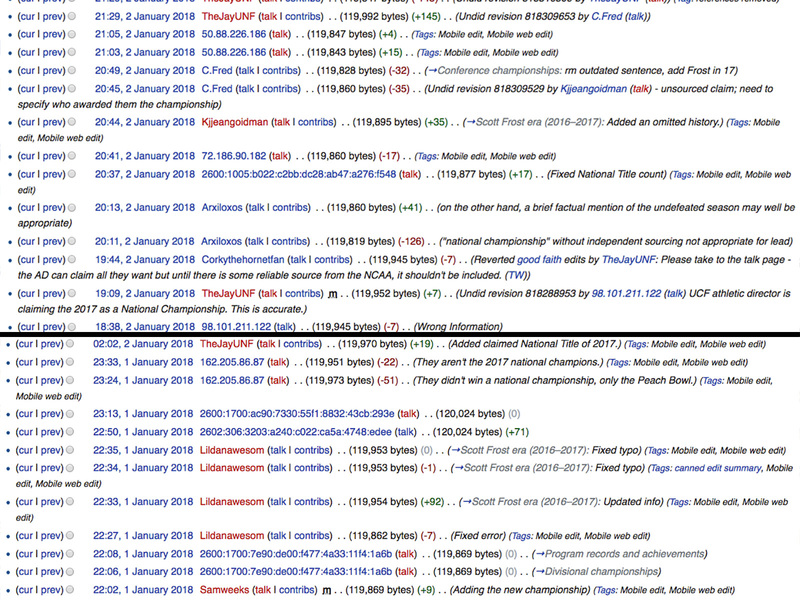 Wikipedia strives to document the truth in a neutral way, which makes the ongoing battle over UCF’s national championship claim … complicated. Flanked by his parents in Section 235 of Atlanta’s Mercedes-Benz Stadium on New Year’s Day, University of Central Florida senior Eli Fried watched his classmates celebrate their Peach Bowl win and thought, This is going to be big. That victory over Auburn meant UCF would finish its season 13–0, the only lossless team in the FBS, and athletic director Danny White would declare, “Undefeated. National champions.” It meant applications would skyrocket and the 64,000-student Orlando university would be in the news for days. But that’s not what Fried meant. The confetti has long since been vacuumed from the Mercedes-Benz Stadium turf (twice, actually; the title game was held there, too). The parade detritus has been swept up. The rings have been ordered. Outside of Orlando, people largely consider Alabama the national champion and UCF a delightful or exasperating footnote. Yet 10 days after the Tide beat Georgia 26–23 in the title game—and 18 after the Peach Bowl—there was at least one last front in the battle over the 2017 college football season. This is what Fried predicted from high above the field. “I thought about how crazy it would be on Wikipedia,” he says. Yes, despite what an entire generation of history teachers has preached since the collaborative encyclopedia launched in 2001, Wikipedia editors largely try to get it right. So a disputed championship such as this one created a problem for a group that views itself as writing the first draft of history. Disruptive editing—or edit warring, as it’s informally known—makes this job more difficult. The two most contentious subjects on Wikipedia tend to be politics and sports, but the aftermath of an election does not usually include heated fans rushing to the loser’s page to change the “owner” to their candidate’s name. Because Google considers Wikipedia to be a reliable source, this kind of vandalism can occasionally have search-engine consequences; Wikipedian Zezhou Jing, a 23-year-old engineer, notes that Google results the day after Florida fired coach Jim McElwain this fall informed users that he had died. The problem in UCF’s case stems from the fact that the NCAA does not award an official Division I FBS college football title, so there is no one definitive answer. Often the 40-plus approved polls and formulas will agree on the first-ranked team, and often that team has won the national championship game, and often no other team has announced that actually it believes that it is the champion, and in those years the whole process runs relatively smoothly. But this season was more complicated—Alabama didn’t even make its conference title game, leading some critics to argue that its win was tainted because it should not have made the four-team playoff at all. UCF, whose strength of schedule did not excite the playoff selection committee, never got a shot at the big guys until the Peach Bowl. So when the Knights claimed the title—and especially when one of those formulas, the Colley Matrix, agreed with them—Fried, himself a Wikipedia editor since high school, knew it would get contentious. He flew back to campus from the Peach Bowl, checked the 2017 UCF Knights football team page, saw the disruption (at one point there was an edit every 97 seconds) and submitted a request for an administrator to block modifications from unregistered users. Most of the time the activity was just a constant insertion and then immediate deletion by someone else of the phrase “national champions”; occasionally someone wanting to fix spelling would wander in and then quickly wander out. Wikipedia allows users to explain their changes. Explanations included “Roll Tide,” “NOT NATIONAL CHAMPIONS” and “fake news.” Eventually an administrator blocked these “randos”, as many Wikipedians call them. In the meantime, on the message board attached to the season page, the community held a heated discussion over how to handle the dispute. At issue was not the claim itself; it’s easy to tell the whole story in the body of a page. The problem is that many ancillary pages are affected by whatever the editors collectively decide. At the bottom of the page of then-UCF coach Scott Frost, now at Nebraska, is a table listing his season-by-season records. Should 2017 be highlighted in yellow, for a conference title, or in orange, for a national championship? What should the info box—the gray rectangle in the upper righthand corner of all entries—on the main UCF Knights football page list under the heading “National titles”? And what about on the Alabama Crimson Tide football page? Fried admits he’s biased but would like to see the season recognized. “If someone were to walk into the stadium or look at the record books,” he says, “they would want to know what this national championship is they’re talking about.” An editor who goes by bsuorangecrush thinks the whole claim is absurd: “I feel that it is completely asinine for them to think they are national champions,” he says. “As a Boise State fan, I've been through this twice with undefeated seasons yet our fan base and our school never claimed we were champs. … They should act like adults and appreciate the success they have earned instead of proclaiming themselves better than everyone like a pouting little kid.” (Bsuorangecrush asked for his real name to be removed from this story in protest of this column supporting UCF’s decision.) Weiss, a Michigan fan, has mostly stayed out of the debate, more often adjusting formatting than expressing an opinion, but he says coming to a decision as a group is important to him. No such decision has yet been reached, although the arguments have mostly died down in favor of reasoned discussion. At press time, the title claim had made it into the Knights’ info box (a compromise; the heading was changed to “Claimed nat’l titles”) but been omitted from less-UCF-focused pages. The semi-protection is set to expire this week, which will allow randos back into the discussion. For Jeffrey Whidden, a 32-year-old order writer for a steel company, the question was even more removed than the color of Frost’s table. How should the info box for the 2017 Alabama Crimson Tide football team page refer to the season? (That page underwent 252 edits from mid-November to mid-January; of those, 124 came on Jan. 8 and 9, and 60 of them came from unregistered users.) He felt strongly that “consensus national champions,” which someone else had added, was inaccurate. “In the broader sense of language consensus is what they should be,” Whidden says, “but how we use it in college football, they shouldn’t be.” He suggested adjusting the terminology on every page to use three levels—unanimous national champions, consensus national champions and simply national champions—but received little support. He offered “co-champions,” which also fell flat. He offered to compromise by making this case “national champions” and leaving the old ones, but he was alone there, too. Whidden is unmoved. He notes that many of the people opposing him have Crimson Tide references in their usernames, so he’s put it aside. For now. “I’ll give it a couple weeks,” he says with a laugh. And so the war goes on.